A conveyance of land in this state can be made by deed, signed and sealed by the grantor, and acknowledged or proved, and then recorded as provided by law. The form for a warranty deed appears in 34.15.030 of the Alaska Revised Code and is written without express covenants. A deed of this type, when duly executed, is considered a conveyance in fee simple to the grantee and the grantee's heirs and assigns, with the following covenants from the grantor: (1) that at the time the warranty deed was made, the grantor was lawfully seized of an indefeasible estate in fee simple to the premises described, and has the right and power to convey the premises, (2) that the premises were free from encumbrances at the time the deed was made and delivered, and (3) that the grantor warrants the quiet and peaceable possession of the premises, and will defend the title to the premises against all persons claiming the premises (34.15.030). After-acquired title or interest will pass by operation of law to the grantee or the grantee's successors in a warranty deed executed in Alaska (34.15.07). 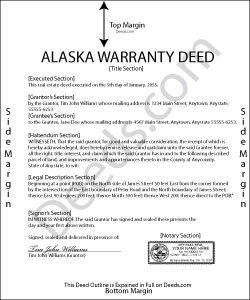 An Alaska warranty deed should be acknowledged before a person authorized to take acknowledgements or proved in accordance with law. The officer taking the acknowledgment should endorse on the deed a certificate of acknowledgement and the date the acknowledgment was made (34.15.150). If executed in a state other than Alaska, it may be executed according to the laws of the state and acknowledged according to 09.63.050. A conveyance can also be proved by subscribing witness, the details of which can be found in 34.15.210 of the Alaska Revised Code. The purpose of recording a document is to register property rights with the state of Alaska so that ownership can be proved. When a warranty deed is recorded in the registry district where the land is located, the recorded document is constructive notice of the contents to subsequent purchasers and holders of a security interest in the same property or a part of the property (40.17.080). A warranty deed in this state is void as against a subsequent purchaser in good faith for valuable consideration of the same property or part of it whose conveyance is first duly recorded. Unrecorded warranty deeds are valid between the parties to it and one who has actual notice of it (40.17.080). A conveyance should be submitted for recording in the recording district where the land is located. When submitting a warranty deed for recordation, the recording district must be stated on the document. Ken S. said: Easy to downloand. Instructions were helpful and easy to follow. Made the process a lot easier for me. Reply from Staff: Thanks Ken.